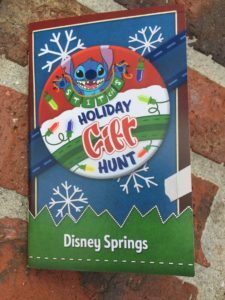 Disney Springs has a lot to offer this holiday season. The Trail of Trees, nightly tree lighting, live entertainment and dance party, sculpture photo ops, special celebrations for Hanukkah and Kwanzaa, photos with Santa, and Stitch’s Holiday Gift Hunt. Everyone’s favorite alien, Stitch wants to buy gifts for his ‘ohana. He has 12 family members and friends on his list he needs to buy for. Your job is to go from store-to-store looking for Stitch who is holding a gift. 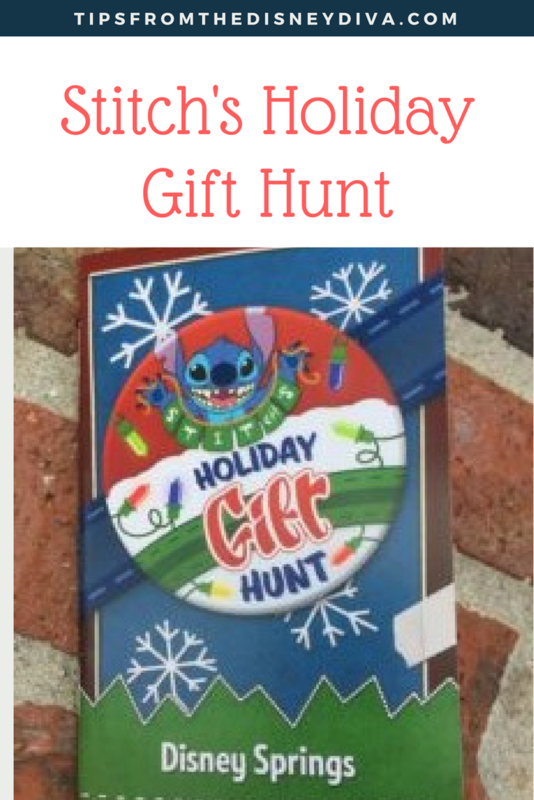 Once you spot Stitch you attach the coordinating gift sticker to the booklet. 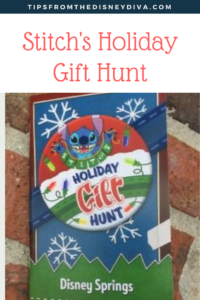 Stitch’s Holiday Gift Hunt is free (while supplies last) now thru January 8th. This is fun and easy for the whole family. You pick up a booklet, walk through the stores, find Stitch and match the stickers to what he is holding. Once you are done, you show your booklet at the designated stores to redeem your prize. We were there on Black Friday and most Cast Members had the booklets. We were on a mission to see Santa and picked ours up with our buzzer. There were a few clues around us, so while we waited to see Santa we looked for Stitch. 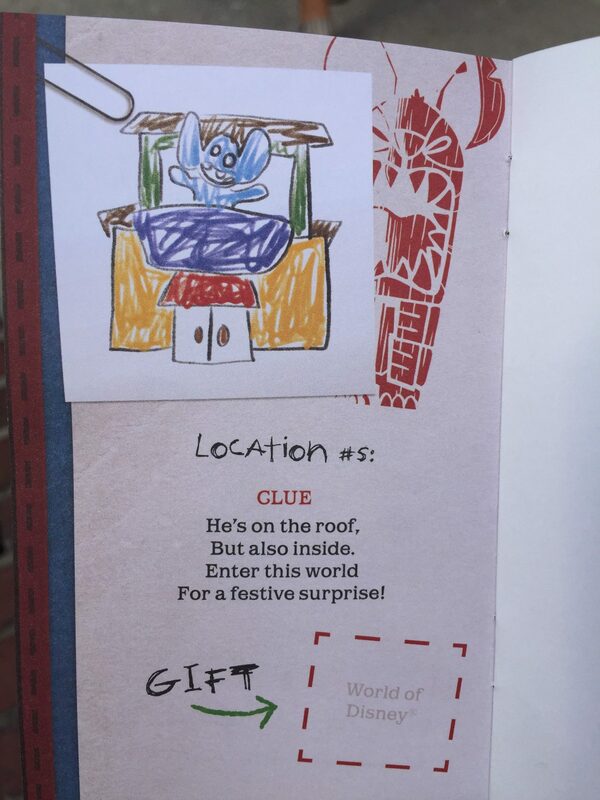 The booklet contains a map of Disney Springs highlighting where Stitch is, clues, and stickers. The booklet is pocket-sized making it easy for even the littlest hands to hold on to. There is a list in the back of where to take your booklet to when finished to redeem your prize. Stitch hiding out. Once we knew what we were looking for, it became a lot easier! actually go in the stores. The only hint I’ll give is that he is out of reach in every store. 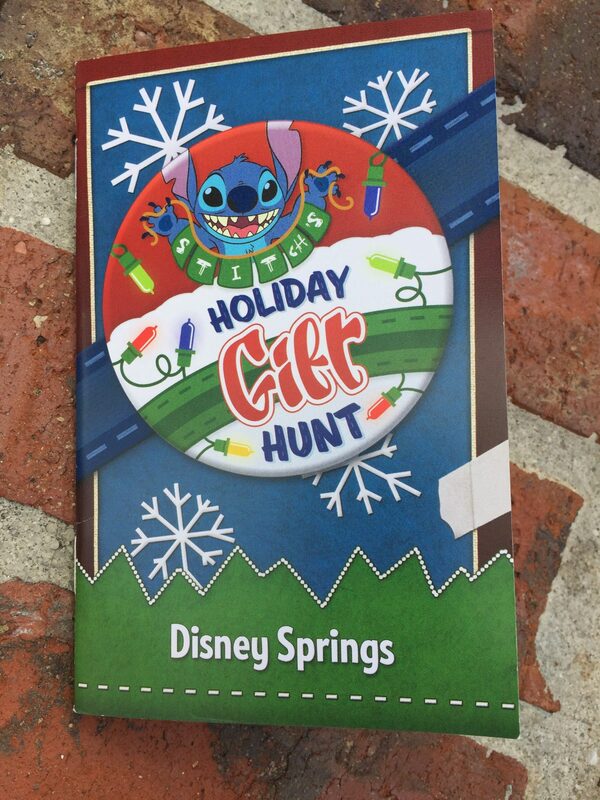 Once you have completed Stitch’s Gift Hunt head to one of the designated stores to pick up your prize. 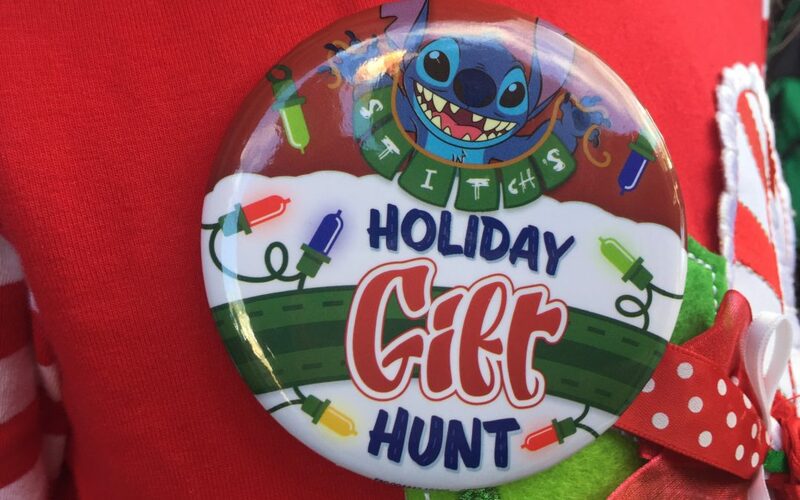 The prize is an adorable Stitch button highlighting the gift hunt. My kids thought it was pretty cool and wore them proudly. You only get one button per booklet. If everyone in your party wants a button, they need to each fill out a booklet. She was so proud she found all the Stitch’s! 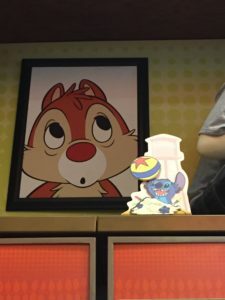 While searching for Stitch take some time to look around the stores. Some stores offer free services- fun bath items you can wash your hands with at Basin or play with the Potato Heads at Once Upon a Toy. Other spots offer free samples-Ghirardelli’s had pepperment chocolate squares and The Ganachery had fudge samples. 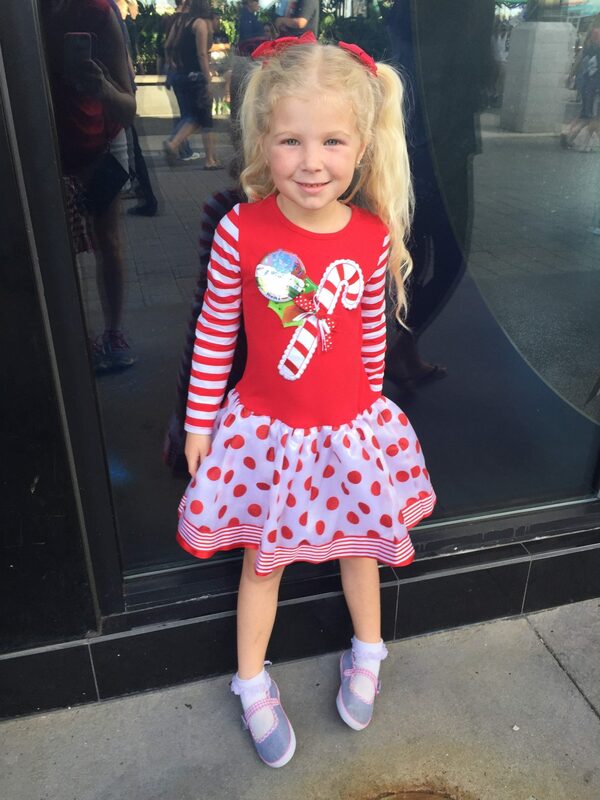 Take your time, enjoy all the Disney Springs has to offer for the holidays and have fun! 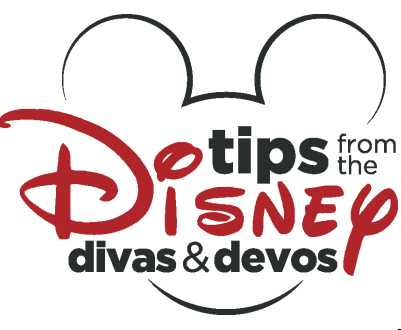 If you’re looking to book your next trip to Disney Springs (or anywhere else), consult with our FREE Disney Diva Travel Agent Patricia at All for Dreams Travel to help you plan your most magical vacation yet!